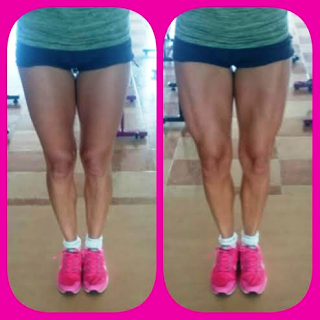 So – here is a progress picture of my leg development, can you guess how long this took for a natural bodybuilder? Well you might be surprised…. When I started bodybuilding- Instagram hadn’t really took off yet and bikini competition hadn’t even started yet- bodybuilding was still very much an underground sport – many of the newer more commercial federations hadn’t come into existence and the womens sport was pretty small. It was quite hard to find much information online and it definitely wasn’t the norm to post up progress pics – we all stayed covered and off social media and revealed all on show day. Since the rise of the fitness model comp, bikini competitions and bodybuilding becoming more mainstream, the use of social media has also changed and now its pretty normal to be posting up progress pictures and document our journey on social media and in a world where competition is fierce- not only on the stage, but for sponsorships etc, what we see online isn’t always reality! Its really important to be aware of what we see online – or what the people we choose to follow are letting us see! So back to my question – how long did this take- well, basically just a few seconds- one is relaxed- the other flexing- there is no other difference!!! Firstly – this picture was taken 6 weeks out from a show, if I had only posted the flexed pic, and you compared it to your own non flexed picture – you might feel demoralised- wondering why your legs don’t look like that – but in reality they may look like that if you were flexing too. its become so easy to follow our other fitness athletes and we now have access to other athletes and coaches lives more than ever before. BUT a lot of what you see isn’t real and we need to be aware of this .The Instagram fitness girl might only post up what they want you to see – with edited/ filtered pics- often pics of only their best body parts – or only under the best lighting – all to create an illusion – Coaches do this to get more clients, athletes do this – to get more followers. If I posted up that this was a 6 week transformation, would you have trusted it because why would I lie? There are some very misleading posts on the internet! Be very aware when looking at someone’s pics- are they relaxed or posing hard – it makes a massive difference! Try it on yourself! Try not to have goals to look un-flexed – how people look when flexing hard! Make sure your goals are realistic! I am often on the receiving end of comments about my competition ‘look’ – when I post a stage pic, some will comment that its un-feminine, over muscular – its a bit too much.. but natural muscle doesn’t look hard all the time – and I don’t walk around flexed all the time, when i relax, the muscle relaxes, so I don’t look like I do on stage all the time – even when I’m close to a competition. I was 6 weeks from the stage in these pictures, but walking around day to day, who would know, most people look at me like I’m mad when I say I’m competing soon!! So if you are afraid of lifting weights or competing because you are worried about ending up looking like arnie… if you are natural – that’s unlikely to happen – so go lift some weights and get all the benefits lifting gives you! Some people have also questioned how I can compete in both bikini and figure – in the same competition, on the same day- surely that shouldn’t be possible? Well in natural shows it really is possible to cross one more than one category! It is all down to how hard you flex on stage- you can show different looks in your style of posing, outfits and stage presence! The fitness journey should be fun, positive and empowering, so enjoy your fitness journey and follow other competitors if it inspires you- but just just be aware that what is on the internet isn’t always what it seems!